The full title of this book is Charlie Chan: The Untold Story of the Honorable Detective and His Rendezvous With American History. The author, Yunte Huang, is a professor of English at the University of California, Santa Barbara. My husband and I are both fans of the Charlie Chan mystery novels by Earl Derr Biggers and the many Charlie Chan films that were based on or inspired by the novels. When this book came out, he bought a copy and he and my son both read it years ago. When I first heard about this book, I thought it was about Charlie Chan the fictional character and Chang Apana, the Hawaiian police officer that Charlie was based on. That is true, but it is so much more. The book covers much of Earl Derr Biggers' life and it talks about most of the books he wrote, then moves on to the success of Charlie Chan on film. It also provides some background on the history of racism in the US. All of that is a lot to digest and many reviewers complain that the book tries to cover too much and loses focus. For me, that approach worked fine and made the topic more interesting. The writing was fine and I had no problem staying interested. I was worried about getting too much information about the plots of the books (I have only read 3 of the 6 Charlie Chan novels), but that did not happen. The ones that were mentioned were given an overview and where they fit into Biggers' life. Southern Hospitality, but not for Newcomers is an article by Huang about his experiences in the South in the early 1990's (mostly good) vs. newer laws in Alabama which are anti-immigration. 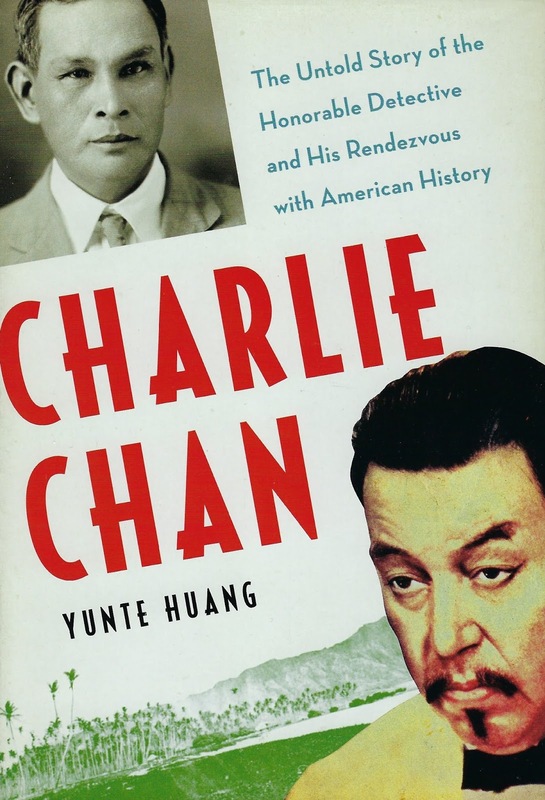 Investigating The Real Detective Charlie Chan gives some information on Yunte Huang and an excerpt from the Introduction of the book. How very interesting! I will admit that I've not ever warmed to the Charlie Chan books or movies, but my husband loves the movies. This book sounds like a great one. It was a very interesting book, Kay. I learned a lot about Hawaii that I did not know. This sounds fascinating, Tracy! What an interesting way to look into a fictional character and his creator. I'm glad you found it both informative and accessible. To me, that's the mark of a good non-fiction book. I was very glad I finally read this book, Margot, and now I have to continue reading the Charlie Chan books. I'm torn. I love the books, but dislike the films. I don't always want to know a lot about an author beyond the books written, I'm not one who wants to judge written works by the life or beliefs or activities of the writer, preferring to evaluate the work itself independent of anything else. By the way, my FFB tomorrow will be a Raymond Chandler short story collection. The books are a good bit different from the films, Rick. I can understand not wanting or needing to know about an author and his background. I look forward to your post on the short story collection by Chandler. I still have lots of Chandler's novels to read but I would like to read his short stories too. I thought I left a comment yesterday, but it seems to have vanished. I got this book from my library yesterday. I'm a fan of the Charlie Chan books and the earlier movies, before they got too campy and silly. Sorry, Joan, I know blogger has problems with comments sometimes, but never have figured out why. We have watched most of the movies, but the early ones are better. Ahhh, so! I love this kind of book. I enjoyed the Charlie Chan movies ages ago (it's where I learned to say "ahhh, so!") but have not read any of the novels. As Det. Chan might say, "Inexcusably remiss." I shall endeavor to correct this! I have read the first two books, and the last one, Mathew, and I can't remember which I liked best. Maybe the first one, but Charlie doesn't show up for a while. I read this several years ago and wrote about it then. In fact, the author commented on my blog. (Which I always get a kick out of.) I enjoyed learning about 'the real' Charlie Chan. Funnily enough, the author doesn't mind the Chan movies and I'm in agreement with him. I love the Chan movies. Listen, this guy was always the smartest man in the room, the one who solved the crimes and left everyone else reeling. I've also read a few of the books and liked them too. I love the re-issued cover art. Of the Chan movies, the early ones are my faves. I tuned out when Mantan Morland was added to the mix and the film budgets shrank. I do like the early movies the best, Yvette, but we enjoy re-watching all of them, even with their flaws. I love the cover art on the re-issues of the books too. My husband bought copies of all of them, so I will read all of them eventually. I read this years ago when it first came out. Utterly fascinating. Reading about Chan's inspiration got me interested in reading the Chan novels and later watching the first series of movies with Warner Oland as Chan. Most of the Sidney Toler movies can't stomach. IMO, the Chan books have nary a trace of the ugly racist depictions so many PC critics claim them to have. Really the impersonation of an Asian as portrayed by a white male actor is what got everyone's undies in a bunch. I agree, John, it is a fascinating book, packed with information. I did not know what to expect when I read the first Charlie Chan book, and I found it a very pleasant surprise. Hope you enjoy it, Keishon. I am now reading another shorter, more focused book on Earl Derr Biggers. There was a magazine with novelas in each issue. Charlie Chan Mystery Magazine. I hear they were collected in a book more recently. That is very interesting. I will have to look into the magazines. Thanks so much for that info. Charlie Chan is unknown territory for me - obviously I'd heard of him, but I don't think I have read the books or seen the films. You are tempting me. I do understand the pull of books like this, it's lovely to wallow in one about a character you know and like. It was a very interesting book, Moira. The Charlie Chan films have been controversial because of racial portrayals (and not just of the Chinese characters). I don't see that at all in the books, and the author of this book sees the subject from both sides and has many interesting thoughts on that subject. Probably not one that excites me if I'm honest, Tracy. I do have something from the author stored on the Kindle pile! I don't know how you will like Charlie Chan novels, Col, they might be too tame for you, but they are interesting for the time period.